Rear-end accidents are one of the most common types of crashes in Illinois. While these types of collisions are common, the impact of these collisions are anything but common for the drivers left suffering from injuries. At the Law Office of Adrian Murati, our personal injury law firm stands up for drivers injured in rear-end accidents. As a Rockford car accident attorney, I pursue my clients’ rights to have the other drivers’ insurance company pay for their medical expenses, the cost for fixing the damage to their car or getting a new car, and for time missed from work while recovering. If you or a loved one have recently been in a rear-end car crash, you can call me at (815) 289-3209 to discuss your legal option. You can also continue reading to find out more about rear-end car wrecks. Tailgating – Illinois law requires drivers not to follow more closely than is reasonable and prudent. 625 ILCS 5/11-710. Driving too close behind another vehicle can lead to a rear end collision. If the driver in front stops quickly then the tailgating driver cannot react in time and will likely crash into the other vehicle. Driver Distractions – Distractions come from a variety of sources and include cell phone usage, eating, listening to loud music, conversing with passengers, looking into the back seat to check on young children, putting on makeup, and not keeping eyes on the road. Drunk Driving – Drinking and driving comprises a driver’s reflexes and makes it difficult to judge distance. While reaching for beer cans or other open containers of alcohol, the intoxicated driver diverts his eyes. Falling asleep at the wheel is also a common occurrence for drunk drivers. Driving High – Marijuana can impair a driver’s reflexes and when the driver in front stops or slows down, the high driver may not be able to react in time. Marijuana users may be “spacing out” and not paying attention to the road. A stoned driver may be smoking in the car and distracted by lighting a pipe or puffing a joint. Weather Conditions – Rain, snow, hail, slush, ice, fog, and high winds can make it difficult for a driver to see the road in front and stop the car in time. Road Defects – Pot holes, stop signs hidden behind trees or bushes, and malfunctioning traffic signals can all lead to a rear-end collision. Animals – Animals in the road can startle a driver and cause them to break suddenly to avoid hitting the animal. Children – Children wandering into the street, especially in residential neighborhoods. Unexpected stopping because of a child’s soccer ball, baseball, or football. Pedestrians – Jaywalking pedestrians can cause a driver to stop suddenly. Construction – The sudden appearance of a construction zone or workers and backed-up traffic because of the construction. Police – Speeding drivers often stop suddenly when they see police cars or radar guns. 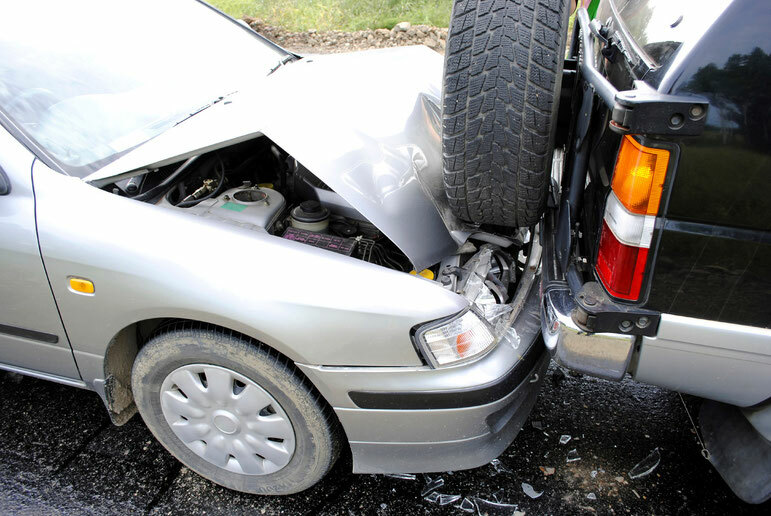 Accidents – Car accidents in front of the drivers can bring the entire lane to a sudden stop. While fault in a rear-end car accident may seem straightforward, the other driver’s insurance company will actively be looking for ways to deny the claim. Often, the other driver will try to shift the responsibility for the accident to you and claim that you suddenly stopped and caused the accident. Even worse, you could find yourself tangled in a counter-suit by the at-fault driver. Another common scenario involves the insurance company claiming that both drivers were at fault and offering a reduced offer to reflect the “apportionment of fault.” For example, the other driver admits he was driving over the speed limit but claims that one of your brake lights was broken which meant he didn’t know you were braking and that contributed to the crash. In this situation, the insurance company will likely push to get you to take a lower settlement offer. While rear-end car accidents might seem pretty straightforward at first glance, complications can arise that can make this type of case tricky without an attorney. At the Law Office of Adrian Murati, we are dedicated to helping you get your car fixed, your medical bills paid for, and recovering lost wages for any time you missed at work. Call me at (815) 289-3209 to discuss your personal injury case. Copyright © 2017. We have created this website for information purposes only. While efforts are made to ensure the accuracy of the information on the site, these materials are not a substitute for advice from aqualified attorney and should not be relied upon. The information on this website is for general purposes only and should not be interpreted to indicate a certain result will occur in your specificlegal situation.